Frieda Loves Bread: Chicken Stock: The FAST & EASY Way! 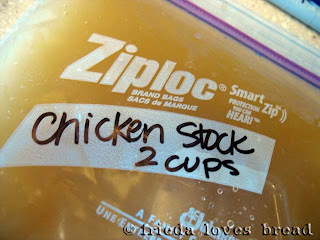 9 Chicken Stock: The FAST & EASY Way! Ever have one of those nights that you just don't feel like making dinner? Rotisserie chicken to the rescue!! Come on, I know many of you buy them; even I do! It's the best $5 I've ever spent on a dinner. How many of you have a pressure cooker? Stove top or electric? If you don't have one, seriously consider purchasing one. Foods are cooked more quickly and retain more of their nutrients. My friend bought an electric one and she loves it! It is truly "set it and forget it" and keeps foods warm until you are ready. My stove top pressure cooker can't do that. She says that you can even make risotto without stirring!?! For a fraction of a second, I wished that my pressure cooker would just give up and die, so I could be justified in purchasing an electric one. Then the thought came, "What if the power were off?" I have a gas stove that works in a power outage and a stove top pressure cooker would work. 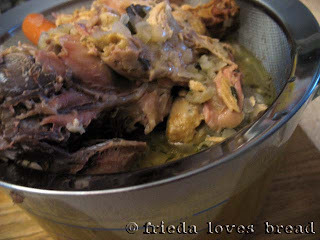 So what do you do with your chicken carcass? Throw it away? *Gasp* Come on, you can make some of the best chicken stock you have ever tasted! It is so easy! 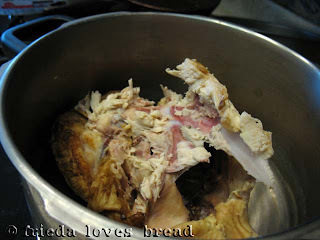 First, dump the carcass into your pot, bones, skin and all. I really have an aversion to touching raw meat and dealing with bones, but here goes! Next, throw in some carrots, an onion, dried parsley, a smashed clove of garlic and maybe some dried thyme and a bay leaf or two. Whatever you want to flavor your stock. Pour 10 cups of water into the pan. See this little indentation by my finger? That is the maximum liquid line for my pressure cooker. You don't want any more liquid, or else it would spout out and make a big mess. Put the lid on and the round, weighted thingy. Turn the stove to high and wait for the steam to come out of the weighted thingy. I'm sorry, I have no idea what it's called...Once steam comes out of it, turn the stove down to medium or medium-low and forget about it for 40 minutes. But wait! Look folks, here it is in its full golden-brown glory. Oh, the smell is just intoxicating! Put the stock in the fridge overnight and scrape off any remaining fat. Freeze it. 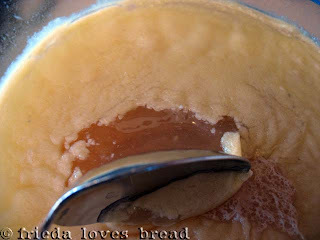 This stuff freezes really well ~ stay tuned to see what I made from it! I love the convenience of rotisserie chicken! Like you, I make stock with the carcass. 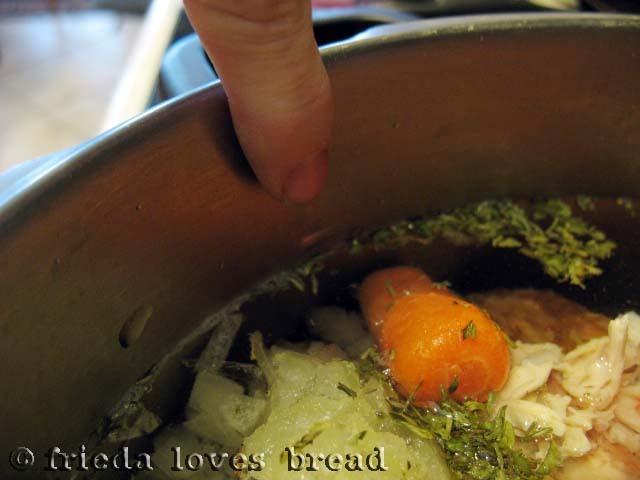 I make it with the same seasonings as you, but I have never used my pressure cooker. (I'm having one of those V-8 moments....slapping my forehead here)! Why didn't I think to use it before???? I will definitely use it next time. I love to have a supply of homemade stock in the freezer. I lost out at Thanksgiving, though. My husband & son, who were being nice and cleaning up the kitchen while I sat down after dinner, threw the turkey carcass into the garbage!! I appreciated their help, but was secretly mourning the loss of my unmade turkey stock! Dang! 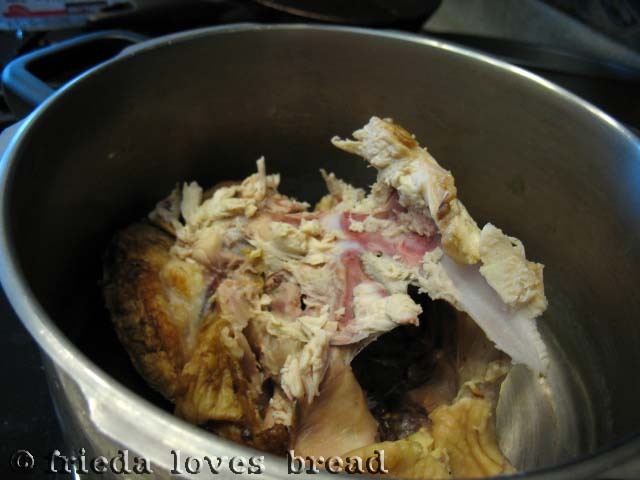 I just used some rotisserie chicken for my chicken and dumplings and was in a hurry so threw it away! 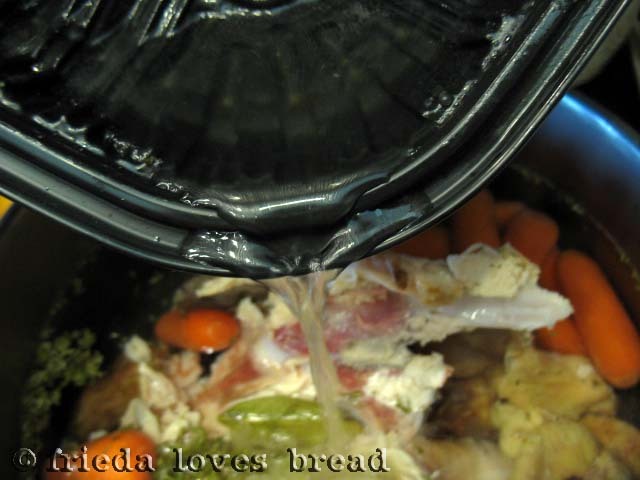 I remember making soup out of the carcass before and it took about an hour with the lid on but I think it would have been better if I had cooked it longer 9still good though). I will use my pressure cooker next time. And I never thought to just make broth and freeze it. Thanks! You ladies are SO welcome! Julie, Cindi tells me that she puts a whole, washed onion, skin and all in here stock, which turns it a beautiful brown color. Cooks hers on simmer for 2-3 hours with the lid off-set. 40 min. vs. 3 hours? Time to dust off the pressure cookers! Well- that does it! I have to get a small pressure cooker (today!) The only one I have is a monster that will pressure-can 8 quarts at a time. Just a little large for everyday use. Great tips! Looks delicious and thanks for the tutorial! 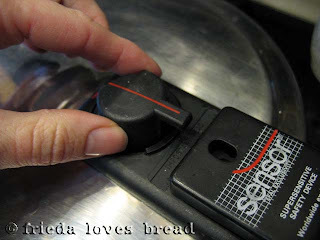 I have a pressure cooker I bought a few years ago, had all these grand ideas in my head, then could never figure it out! I'm going to have to drag it out again. 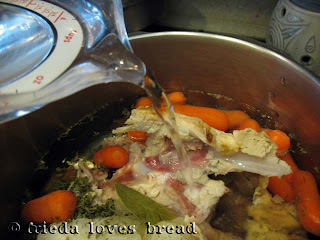 I make homemade soup all the time but just make a basic chicken broth, not a true stock. Thanks for commenting, Denise! I'm glad you made this and that your hubby LOVED it! 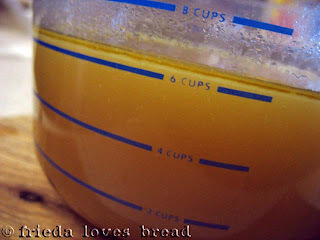 Psstt...I just bought an electric one, and made beef stock from the leftover Prime Rib bones! The post will be up soon, I promise! A pressure cooker is like a cross between a slow cooker and a microwave...you'll get the slow cooked flavor in less time!